Assistant coach Jason Demetriou has been sacked by the Broncos. The bloodletting at Brisbane has continued with Wayne Bennett's assistant, Jason Demetriou, today sacked by the Broncos. News Corp can reveal Demetriou had his contract torn-up this morning, leaving Bennett's right-hand man at Brisbane without a job just three weeks before Christmas. And more heads are set to roll, with high-performance chief Jeremy Hickmans and Bennett's chief analyst Scott Barker expected to follow Demetriou out of Red Hill in the next 24 hours. Darius Boyd, Wayne Bennett and Jason Demetriou at training in August. Demetriou was summoned to a meeting with Broncos CEO Paul White today where he was advised he was surplus to requirements. 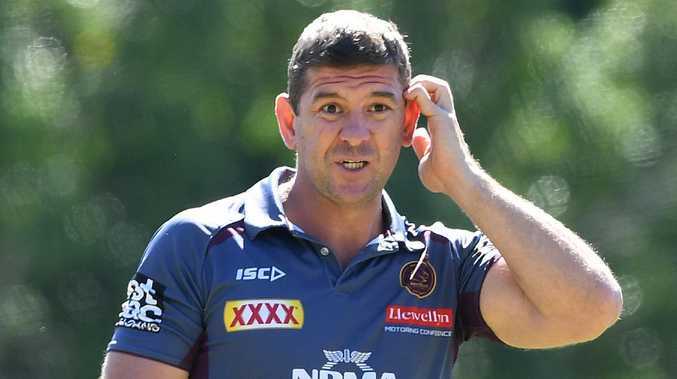 Demetriou was contracted to the Broncos until the end of next year but has been offered an immediate payout as Bennett's replacement Anthony Seibold ushers in a new era at Red Hill. Seibold presided over Broncos training this morning with a team of new assistants including Peter Gentle, Ben Cross and high-performance manager Paul Devlin, with whom he worked at former club South Sydney. 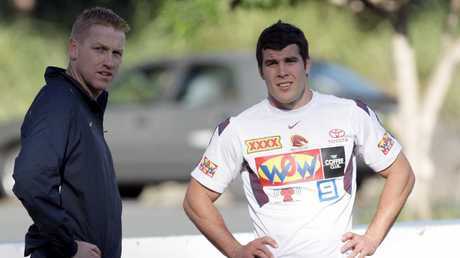 Jeremy Hickmans pictured with Michael Ennis at Broncos training in 2008. Demetriou was expected to follow Bennett to Redfern, but it is understood that won't happen, with South Sydney committed to contracts with their existing staff. The sacking of Demetriou has capped a turbulent period for Bennett's assistants. Demetriou, Hickmans, Barker and trainer Tannath Scott were advised to stay away from Broncos HQ for a week while Seibold's squadron settled in. They had their emails shut down immediately and their contents packed in boxes ready for collection. Eventually, Bennett was sacked, a scenario that was always going to put his assistants in the firing line. The fallout is a real blow for Hickmans, who received a job offer from the Gold Coast Titans two months ago, only to stay loyal, believing Brisbane would honour Bennett's deal for 2019. In July, Bennett tabled a proposal for Demetriou to succeed him as Brisbane's head coach in 2021, but that blueprint was rejected by the Broncos board. Demetriou was popular with Brisbane players and played a key role in their attacking structures over the past two seasons. It is unknown whether he will remain in Queensland as he attempts to chase his NRL coaching ambitions.